Art of Vintage is a vintage shop in the Killarney community, SW Calgary, specializing in one-of-a-kind vintage finds and superbly personalized customer service. Nothing makes our hearts beat faster than matching one of our unique vintage pieces with the perfect new owner. Our owners source each and every one of our items, so you won’t have to look any further than our store to learn the history and story behind them. In our store you’ll find authentically Canadian items as well as vintage inspired pieces & home décor. Whether you’re looking for the perfect blend of classic and quirky to add to your modern home, or an authentic period piece for a photoshoot or event, Art of Vintage can help you create a style that’s all your own. Art of Vintage owner, Heather Oliphant. Meet Heather Oliphant, the woman behind Art of Vintage. Heather’s love of the uniquely vintage began with her father, Kenny. Kenny always saw the best in old clutter and was determined to bring new life to items ranging from a 1946 homemade snow plane to a 1927 #15 Caterpillar. Kenny’s love of refurbishing old items has clearly been passed down to Heather as she continues to fill Art of Vintage with authentic pieces of Canadiana, saving so many beautiful items from the typical fate of the landfill. 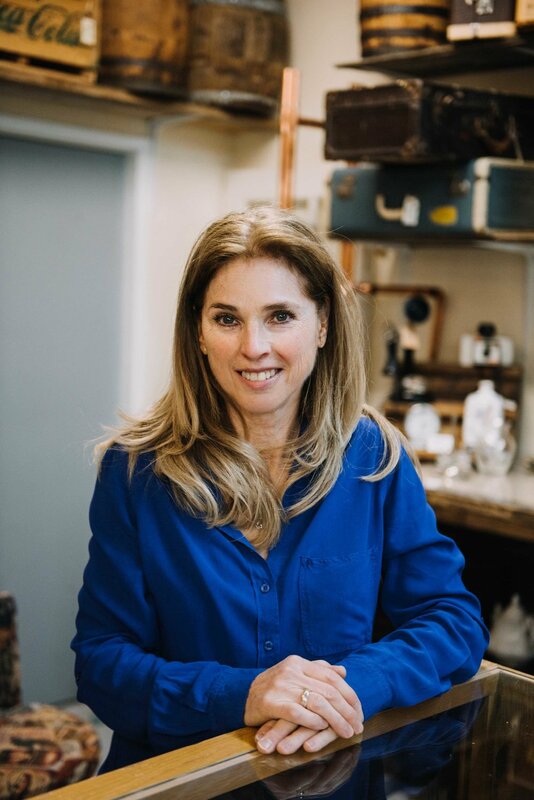 Perhaps Heather’s favorite part of this family business has been introducing quality antique and vintage pieces to the younger generations, who share her passion for repurposing and saving items from becoming unnecessary waste. Heather is the heart and soul of Art of Vintage, overseeing big picture and day-to-day operations of the store. Everything she does is in service of increasing awareness of the store and its services. Heather is joined in business by her younger sister Lori. Lori and Heather have both been on the Calgary market scene since 2012, putting their inherited talents to good use. Lori is Art of Vintage’s master picker. She travels around Calgary and surrounding area to find the store’s perfect vintage pieces, from unique furniture to mirrors and glassware. She also loves to help out in the store, rearranging inventory to showcase the versatility of each unique piece. Chelsea is our marketing and social media manager. She looks after all our social media posts that keep customers up to date on whats new and exciting at the shop. Her posts keep customers refreshing our Instagram & Facebook pages. Colleen is our manager and online sales director. She’s responsible for the ongoing inventory updates that keep customers checking our website, and shopping at our online store. She keeps them happy by promptly responding to and following up on all our inquiries. Jennifer assists with graphic design, web development, photography & copywriting, Most recently completing the Art of Vintage online store.